Emilee Dunton ’14, ’15 M.A.T. strikes a pose with her players during practice. Emilee Dunton ’14, ’15 M.A.T. grew up tagging along with her father while he coached Liberty University’s men’s basketball team, leading them to a Big South championship and NCAA berth. The countless hours watching—and playing basketball—with her dad paid off. Eventually, Dunton left her job as water girl behind to make her own name for herself on the basketball court. It was no surprise to hear her talk growing up about being a coach herself one day. Yet, while taking education courses at Randolph College, she began envisioning a different future. Emilee Dunton ’14, ’15 M.A.T. rallies her players during practice. 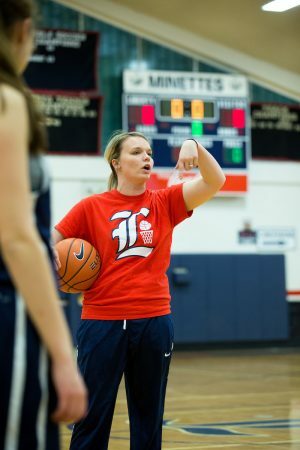 These days, she is merging both of her passions by serving as a special education teacher and head women’s basketball coach at Liberty High School, in Bedford County, Virginia. The Liberty team earned a successful 18–5 record and a conference finals appearance this year under Dunton’s leadership. As an added plus, she is once again sharing the court with her father. Dunton’s dad volunteered as an assistant coach for her last year and is now serving as the men’s basketball coach at her Bedford County school. She often talks about the lessons she learned on the court and in the classroom with her students. In addition to fostering her intellectual curiosity and time–management skills, her professors encouraged Dunton to constantly set and accomplish goals. 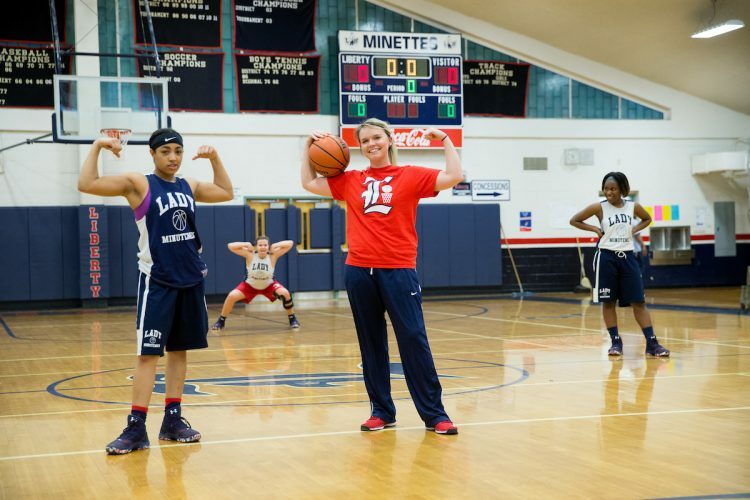 The positive influence she’s been able to have on her students has made her rethink her ultimate, lifelong goal to become a college basketball coach. She’s even considering pursuing her doctorate and becoming a school administrator.